The 2019 Chevrolet Blazer leaves trails behind on its path to conquering all roads. The all-new crossover from Chevy challenges the conventions of design with a startling blend of luxury and utility. If you’re interested in this model, let our overview show you the ins and outs of the new Chevrolet Blazer. Unique trims help the 2019 Blazer stand out from other CUVs. The Blazer RS injects the design with attitude, featuring a black mesh grille, a performance-inspired front air dam, and a black Chevrolet bow tie emblem. The interior of the RS also gets black leather seats with red accents. For a more cool and collected design, the Blazer Premier exudes class with its chrome accents and suede microfiber seating surfaces. Trim upgrades work as well as they do thanks to the base Blazer’s strong design, featuring an athletic stance and aggressive ultra-thin LED running lights. An available cargo management system also brings new functionality to your storage space, enabling you to transform the Blazer from a commuter car to a weekend warrior in an instant. There are two Chevy engines available for the Blazer. There’s the standard 2.5L ECOTEC® engine, which gets an EPA-estimated 27 mpg on the highway, and there’s the available 3.6L V6 that grants 305 horsepower and up to 4,500 lbs. of towing capability when properly equipped. The V6 is standard on RS and Premier models and comes paired with a 9-speed automatic transmission. Both engines feature Variable Valve Timing technology. The Blazer is available with all-wheel drive (AWD), and the RS and Premier can take advantage of Chevrolet Advanced AWD. The advanced drivetrain gives drivers greater control thanks to a twin-clutch rear-axle design. With AWD equipped, drivers can change the drive mode to the setting that best suits the conditions. Available settings include Tour, All-Wheel Drive, Sport Mode, Off-Road, and Tow/Haul. The dynamic and exciting 2019 Blazer can be yours when you visit our Lake Park, Florida, dealership. 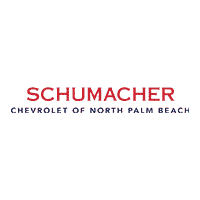 Schumacher Chevrolet has a large inventory of new and used cars for you to test drive, and our staff is on call to tell you about whatever car you want. We look forward to showing you why Schumacher is the place to buy your next car.